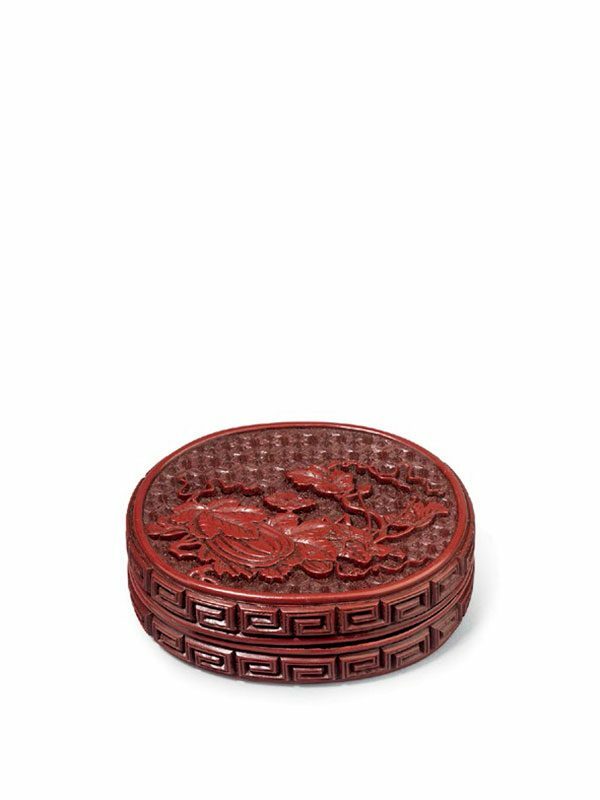 A cinnabar lacquer box of oval form with straight sides. The flat top is carved with a cricket perched on top of a branch of melons with leafy vines and tendrils, against a background of finely carved starburst diaper. A double linked key-fret band runs around the sides of the box and cover. The interior and the base are plain and lacquered in black. The box is contained in an old Japanese wooden box and a brocade pouch. Both the oval form and decorative motif containing insects and vegetables are unusual in Ming dynasty lacquer wares. Crickets (xi shuai) are associated with spring and summer in Chinese art and were probably most valued as decorative motifs because of the homophonous relationship of their name with ‘happiness’ (xi) and ‘auspiciousness’ (xi). Large and small melons or gourds, together with string-like vines and tendrils are a pun of ‘may there be ceaseless generations of sons and grandsons (guadie mianmian)’ or ‘may you have ten thousand generations of sons and grandsons (zisun wandai)’. The combination of a cricket together with a melon pattern invokes a strong wish for sons and suggests that this elegant box was intended to be given as a present. Oval boxes are extremely rare; an oval box dated to the Southern Song dynasty (1127 – 1279), carved with a branch of plum blossoms, is in the Idemitsu Museum of Art, Tokyo. Another oval box depicting a scholar viewing the moon and dated to the Ming dynasty, 16th – 17th century, is in the Tokugawa Art Museum. 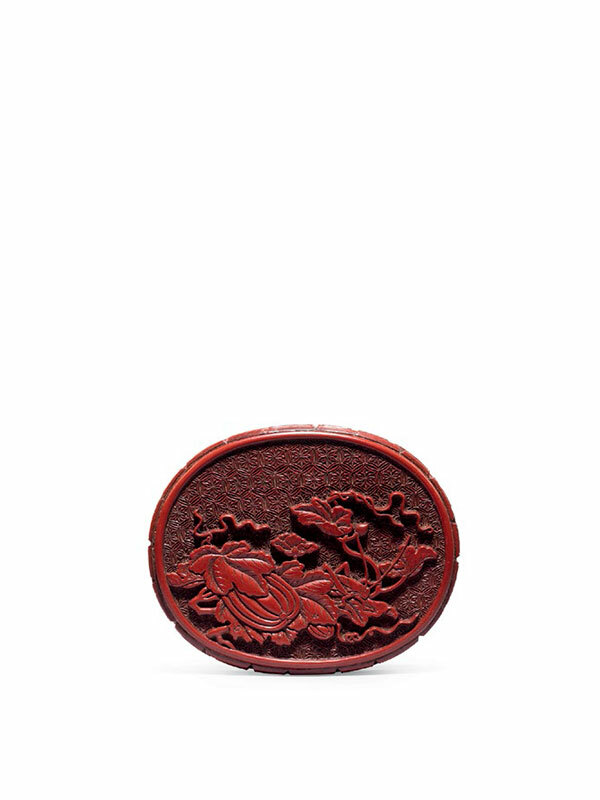 Lacquer boxes with an insect motif are also rare; a Southern Song circular box depicting a dandelion and dragonfly design is in the Nezu Institute of Fine Arts. A polychrome circular lacquer box from the Irving collection, carved with chrysanthemums and a mantis and dated to the 16th century, is in the Metropolitan Museum of Art in New York. A leaf-shaped mother-of-pearl inlaid lacquer box from the Löw-Beer collection at the Linden Museum in Stuttgart, decorated with a mantis and dated to the 16th century, was exhibited at the Museum für Lackkunst in Münster, Germany.